Here we are, another week has gone by and I’ve got nothing to show you. This week was full of getting things in order in my “studio”. The funny thing about my studio is I never crochet in it, because I like to sit on the couch and watch TV (it drowns out all of the other noises and thoughts, such as “I should clean the kitchen.” and “I wonder what Paul is doing”, when I am working). But there was no couch in my studio, only a big bed that I was hanging on to in case we should ever have guests in town. (Said bed was also known as “dumping ground for all of the stuff I am working on or may be working on in the future, or laundry, or mail, or taxes.) I may have mentioned this before, but we’re living in my grandmother’s house right now, with all of her furniture, and it was getting cramped. My mom expressed a desire to put a new mattress in my room so that she could sleep over here when my sister is in town. And then I thought, with the cost of a mattress–we could get a sleeper sofa! About as soon as we agreed on the idea, Paul and I went shopping, and today it is here. I’m not sure that it fills the purpose of having a more comfortable place to sleep, but I do think it’s going to be quite nice for the other 99.5% of the time I am using it! But in the process of moving the bed I decided to also take up the carpet (which was placed over the wood floors a good LONG time ago) and create a huge dust storm and pain in the tokus*. You know, cause we couldn’t actually move all of the furniture out of the room first, that would have made too much sense! All of which I am telling you in order to say: I don’t think I’ve accomplished much that I can share this week. I’ve swatched and proposed and crocheted some things for publication, but you know how that goes. The swatches are pretty though, no? And that green one on the needles? That was me teaching myself to knit backwards–yay! But enough about that– I want to share a few fun crochet-related links I visited this week. - Tahki Stacy Charles has a gorgeous new pattern book called City Crochet available. As a company, they’ve always been good about including crochet, partially, I think (in my head, based on no researched fact) because they provide nice, lightweight yarns that lend themselves to crochet. Click here to check out the pretty. 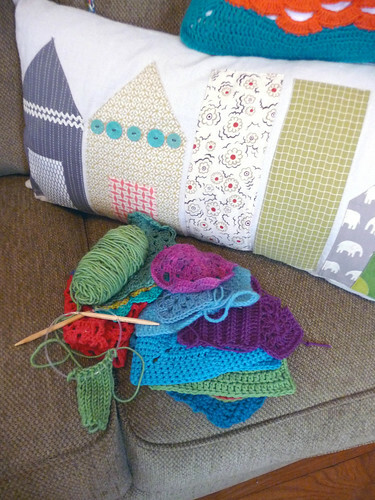 -FuoriBorgo has been delving into Crochet Adorned and has some lovely results to share on her blog. First off are the evolving trivets. I love this post, and her project, because she used the book in exactly the way I intended and hoped. She started out making the trivets as written in the book, but when the shape of hers turned more hexagonal, she combined it with a scalloped trim from another project and a flower pattern from the stitch dictionary to make it her own. I love it! She’s also resizing the Floral Motif Yoke Top (ravelry link) for her toddler- I can’t wait to see how it turns out. -Fellow crochet designer Ellen Gormley is starting a crochet along for her shawl pattern — go check it out and join in the fun! -I’m going to call this one crochet related even though it is really about jello. Check out Brett Bara’s (Editor of Crochet Today and host of Knit and Crochet Now–see the relation?) awesome layered jello dessert. It’s really splendid looking. I don’t think I have the time or patience to ever make it, but I love the way hers came out! -Not really a link, but a reminder for local folks: I still have a few spots in my Broomstick Lace class on Sunday. If you’re interested, please call ahead to sign up. And now, if I haven’t lost you yet… I want to open up the comments for any questions you might have for me. I’m thinking that I get a lot of the same types of questions in my email and it would be fun to put together a FAQ page of sorts, or just to post answers to your questions (Ann Landers style. Oh, I always wanted to be an advice columnist…) over time, especially on weeks where I don’t have a lot to show you. Just remember that I probably won’t answer these in the comments, as that would defeat the purpose–so you’ll have to keep reading. The questions can be about whatever you want, but of course, it’s up to me whether and when I choose to answer them. Please, come up with some fun ones or I’ll have to make them up and pretend I didn’t write them. *Just so you know about the quality I put into this blog, I had to look that word up. And that is not how I thought it was spelled! you are totally awesome and I love you. how do you keep track of creating a pattern? do you write it down as you go or have a formula in your head? how many times do you make it before you feel like it's ready to be published? do you have testers try out each one? I know you put a lot of time into your work and the more I dig into Crochet Adorned the more I admire your style. your patterns are so accessible and easy to monkey with. and where is the link for those cute little dish scrubbies that I randomly found a month or so ago? Linda, I was really hoping to make it to the class on Sunday, but I'm not going to be able to. :( And, I must be the slowest crocheter ever - I'm still working on the scarf! and don't worry, Margaret is still working on her scarf, too!